One of the really clever aspects of The Devil's Advocate is that the title and trailers convey that Al Pacino is, y'know, the devil, even though it's not point-blank addressed until the very end of Taylor Hackford's horror-suspense film. The reveal isn't some colossal, surprising twist; in fact, the experience hinges on that half-awareness of the truth behind John Milton. Without saying a word about it, the tone of the bleak, fiery title cards generates a supernatural atmosphere around what's to come: the skill of a near-invincible rural lawyer, the offer that comes his way, and the lasting gaze John Milton darts at his new acquisition as he walks the streets of the "Babylon" that is New York. The idea sounds like an archaic joke -- the universe's supreme evil pulling the strings of a metropolitan law firm, manipulating innocent fledgling lawyers -- but Hackford's viewpoint keeps this sharp, moody plunge into dark motives and manipulation convincingly straight-faced, and more stimulating under the surface than one might expect. Kevin Lomax (Keanu Reeves) is that fledgling lawyer, a slick Florida defense attorney with an impressive win-loss record and a wavering conscience. 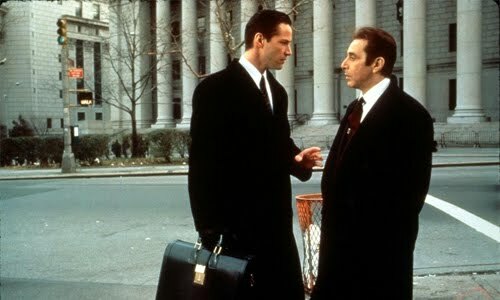 After muscling through a complicated child molestation case, he's offered the opportunity -- along with hefty compensation and expenses paid for his wife, Mary Ann (Charlize Theron) -- to select a jury for a prestigious law firm in New York City, headed by John Milton (Pacino). His success lands him a permanent position at Milton, Chadwick, & Waters, along with all the perks becoming of a major player at the firm, such as a massive apartment and invitations to elegant high-priority parties. Once he integrates into the New York atmosphere, however, the seams holding his life together, and his relationship with Mary Ann, start to unravel in the face of temptation: long work hours to ensure case victories; the allure of socializing with Milton; and the fiery glances from a disarming red-haired colleague (Connie Nielsen). Everything plays out like a convenient stage of events, unnaturally so. Disquieting, subtle gothic atmosphere blankets Kevin's tribulations from the beginning of The Devil's Advocate, observing where he crosses the threshold into a maze of corporeal and metaphysical manipulation as Milton's willing thrall. Sunny Floridian courthouses, churches, and peaceful roads give way to grave, angled municipal rooms and an a lavish yet eerie New York apartment set aside for the Lomax clan, flinty and dim around every corner through Andrzej Bartkowiak's nimble dutch angles and discomforting perspectives. Faces become weatherworn and shadowy outside of Kevin's line of sight, while rich passionate blasts of red slowly emerge, wrapped around the body of a tempestuous woman and lighting the balmy space of a Latin bar. The mood engulfing Kevin's transformation is designed to unnerve, both the Lomaxes and the audience, but elements also entice and playfully taunt those observing -- as if Hackford wants to provoke the senses in ways experienced by Kevin and Mary Ann. Adapted from Andrew Neiderman's book of the same name, the story built around Kevin Lomax's moral testing ground is an intentionally scattered voyage through law procedure, deliberately touching on the ethical integrity of high-profile defense without getting very deep into the details. The Devil's Advocate isn't really concerned with our observation of the cases Kevin handles, outside of the clients' likely guilt, but with how he endures -- and exploits -- the tainted morality of each one; the further he's willing to compromise principles in cut-and-dry health code incidents (hey, there's Delroy Lindo!) and cumbersome murder trials (hey, there's Craig T. Nelson! ), the more he embraces the doctrine that'll make him a key fixture in Milton's practice. The writing from Jonathan Lemkin and Tony Gilroy reaches into the characters and contorts their viewpoints as the cases intensify, teasing us with double-entendres in Milton's language that ensure we're witnessing the devil's work -- to which Keanu Reeves' rigidness and neutral glances create a buyable-enough vessel for malleable virtues. Fusing serious-minded takes on elements from something like The Devil and Daniel Webster with the machinations of a John Grisham novel, that side of The Devil's Advocate speaks little to the horror genre. And it shouldn't; the world around Kevin appears ordinary, as if he's playing his own cards. There's a supernatural undercurrent though, and a ghastly, visceral side emerges around Mary Ann's mental state. Hackford doesn't turn away from nightmarish images, either, creating this grotesque surreal flipside of Kevin's awareness in troubling surreal images of demons squirming in bodies and dangling raw flesh in unexpected venues. Watching Mary Ann (and a fraught performance from Charlize Theron) spiral out of control -- and seeing these shifts in reality spill into Kevin's viewpoint -- strengthens the eerie grand design of Milton's motives, visualized in a chilling quasi-Poltergeist manner. It's impressive how fiendishly the psychology and rapport between Kevin and Mary Ann dismantles, playing on the things vital to each of them. Al Pacino delivers, well, precisely what's expected of him as John Milton, harnessing that absorbing gravitas of his late-'90s scenery-chewing as the omniscient head of the law firm. And, really, I love every minute of it. He's raucous in his persistent speeches, giving Milton's vulgar yet heavily-rationalized rhetoric the bite it needs to appear convincing in Kevin's eyes, while the script uses his unassuming stature as an asset while building his villainy. Milton's impishness does come alive in quieter points of The Devil's Advocate, allowing his wide grin and lively eyes to bolster that expected sinister charisma. 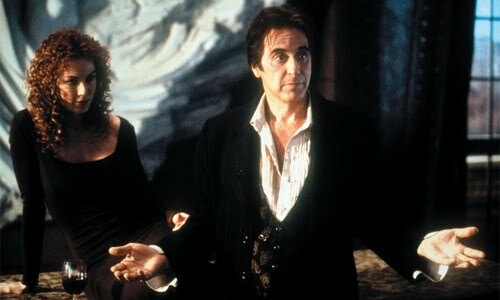 Yet, it's those billowing speeches, where he gnarls on the demands of pressure, skewers morality, and blathers on about the over-privileged, that muster the beast inside the character -- and Pacino's embellished stage presence gives John Milton the fiery vigor he requires. A subtler version of "the devil" might've been interesting, but there's something undeniably magnetic about Milton's archaic, rumbling theatricality. The Devil's Advocate isn't really one for subtlety, though. Gut-churning temptation, violent deaths, and heavy mental distress move the fable feverishly towards its climax -- one that, accompanied by eerie moving statues and Sinatra tunes playing in the background, stops time to reveal the extent of Milton's grand design in a hauntingly mythical display. Hackford juggles theological outlooks and the magnitude of free-will in his thematically extravagant finale, hinged on fatalistic exposition and bleak implications through big, gristly speeches. While the story bloats its pop-philosophical contemplations beyond what it can handle, it's hard to deny the gratification that the outcome generates: a lavish footnote about self-determination and redemption that, somehow, manages to stay neutral on religion as a whole. The battle turns into a brooding, outlandish fantasy of persuasion and integrity, but it's easy to get wrapped up in the scheming of this mythical manipulator without buying into any particular fire-'n-brimstone.